Yes it is that time again for EAA in Oshkosh. The skies are alive with planes of all kinds and I find myself casing out the best place to park and watch the night show…me and hundreds of other locals. I do find that I truly enjoy the planes a great deal this year and the formations are amazing. The War Birds are here this year and while noisy, very uber cool to see them in the air. 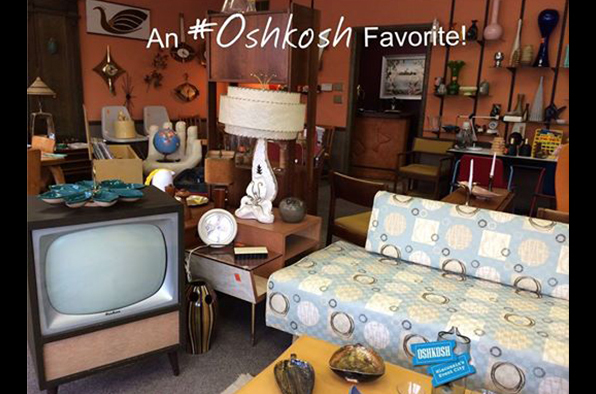 We were very happy to be chosen to be filmed for a segment on Discover WI – Oshkosh. The film crew were so wonderful and easy to work with. It truly was fun. The Host, Mariah, was filmed in some of our fun clothes and it was truly fun to watch her and Jodi search for the right outfits. They started out hesitant and not sure what they were wanting and a few minutes later, they just got into the fun of the clothes … pulling 1 great outfit after another. You will have to wait until it airs to see just how great she looked in them….but she did. We also had the great pleasure of being filmed by a great group of guys from American Dealers. Honestly I laughed so much that I had a sideache …bun fun people. Check out Americandealers.net for their website/eposides. Also check out Phebius Phashion show at AtomicKatz on You Tube… it is fabulous…You too will be laughing out loud. So, I have been known to do retail therapy many many times in my lifetime and one of the things that I truly like to do and it truly brings me pleasure is to see, touch and try on. I guess that truly shows my age but even if I don’t buy, I find pleasure in the process. We have been thinking of our great customers and how much fun …yes FUN they have in the store. and how contagious their fun is. Whether they purchase… or try on and take tons of slefies to post…. it makes no difference. They truly enjoy the time they have spent trying on different clothes and being someone else for a moment. Visit our brick and mortar store located in exciting Downtown Oshkosh, WI! Copyright © 2019 Atomickatz.com. Powered by WordPress. Theme: Accelerate by ThemeGrill.